Abbott Designs Limited is a highly creative company that delivers bespoke design solutions. We provide a wide range of design services including: Web Design, Graphic Design, 3D Industrial Modelling & Animation, Digital Photography, Photo Restoration & Image Manipulation, Audio & Video Editing, Original Artwork. With design consultancy and technical support we ensure our customers ideas become a reality. Abbott Designs create and manage HTML & FLASH driven websites. Websites are designed from scratch, to satisfy the requirements of each customer. Website maintenance is important and customer websites can be updated as requested. Operating Mac and PC platforms we can accommodate all your graphic design needs including, Corporate Identities and Branding, Business Cards and Brochures, Advertising and Packaging. 3D Modelling & Animation play a large part in the entertainment and advertising industries. They are also vital for engineering and construction. 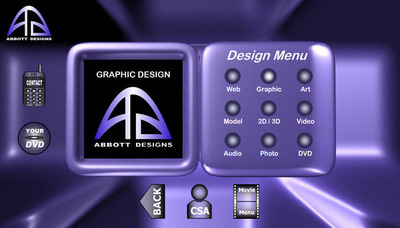 Abbott Designs can produce individual product models for marketing purposes. We can also construct buildings and equipment to show the building or decommissioning of a facility. This can provide contractors and personnel with a greater understanding of the project. For further information, please visit our website, or call on 07981631402. Abbott Designs Limited, provides bespoke digital design solutions including: Web Design, Graphic Design, 3D Industrial Modelling and Animation, Digital Photography, Photo Restoration and Image Manipulation, Original Artwork.